Every few weeks, The Official Star Wars Costumes blog runs a piece on one of the many different characters in the Star Wars Universe (and that’s just a list of “prominent” characters!). While we usually talk about characters from the movies, or perhaps the Clone Wars television show, this week we’re looking at a character that appears mostly in the Expanded Universe: The famous X-Wing pilot and Rebel hero, Wedge Antilles! How well do you know Wedge Antilles? We first meet Wedge Antilles at the end of Episode IV, during the briefing to destroy the Death Star. He voices doubts about being able to hit the battle station’s exhaust port, but is re-assured by Luke Skywalker. He and Luke are the only members of Red Squadron to make it out of the battle alive. They would go on to create the legendary Rogue Squadron, which they both led until the events of Episode V, during which Wedge took full control. He also took part in the attack on the Death Star during Episode VI, and is the only pilot to fly in and survive both attacks. With the Rebels in power, Wedge became known as the Republic’s greatest pilot. He briefly resigned from his post and led a private war against Ysanne Isard, the then-current Imperial leader, successfully ending his rule. Wedge was accepted back into the Republic, forming Wraith Squadron as a commando unit. Nine years after the battle of Yavin, Wedge Antilles became a General at the behest of Supreme Commander Ackbar. He commanded the Deadnought Lusankya. During this time he married and started a family. He would later become New Republic Starfighter Command Chief of Staff, and command Rogue Squadron once more. After reaching an end to the war with the Imperial Remnant, Wedge retired in 19 ABY (After Battle of Yavin). In 25 ABY, the Yuuzhan Vong invaded, and Wedge rejoined the fight. He became commander of the New Republic Fleet Group Three, participating in the failed defense of Coruscant. He made a stand against Yuuzhan Vong ex-warmaster Czulkang Lah, defeating him. This victory led to a significant rise in moral, with the New Republic now aware the invading inter-galactic enemies could be defeated. Wedge would end up being one of the commanders that recaptured Coruscant to end the war. Wedge would return from retirement when imprisoned by the New Republic’s successor state, the Galactic Alliance, in the lead up to the second Galactic Civil War. He sided with his home world Corellia and its revolt against the Galactic Alliance, but came to realize the Corellian leaders were corrupt. He switched sides to the Coalition led by his friend Luke Skywalker, which included the Jedi, a division of the Galactic Alliance after a schism, and other smaller groups. After the defeat of Darth Caedus, the Sith Leader of the Galactic Alliance, the war ended and Wedge retired for the third and final time. Wedge Antilles was played by two different actors during the filming of Episode IV: Colin Higgins and Denis Lawson. Colin Higgins was fired after only a day of shooting, but still appears in the movie for one scene. Both actors had their voices dubbed by David Ankrum. Lawson also portrayed the character in Episodes V and VI. The character came from an early concept of a hotshot pilot with the name Chewie Antilles, but during rewrites of the Episode IV script, the characters were divided into Chewbacca and Wedge. Lawson turned down a role for Episode VII, saying that it would have “bored” him. We hope you’ve enjoyed Character Corner this week! Wedge is one of the dark horse characters of the Star Wars universe, and his adventures are much grander than we could portray here. We’ll see you next time! If you are still reading this, congratulations, you are the first to know a secret! You have a leg up on the competition, be sure to check our Facebook page on Monday for a HUGE giveaway. This week on Star Wars Character Corner, we discuss one of the main characters from the Clone Wars television series, Ahsoka Tano! This Togruta Jedi Padawan was Jedi Knight Anakin Skywalker’s padawan during the series, and serves as one of the show’s main characters alongside Anakin, and Obi-Wan. Ahsoka Tano is in the Spotlight this week! Ahsoka Tano, who would later earn the nickname ‘Snips’ from her master, was born on Shili thirty-six years before the battle of Yavin. She was discovered by Jedi Master Plo Koon at the age of three, and was brought to the Jedi temple. She received training from several masters, including Yoda. The council decided to assign Ahsoka to Anakin Skywalker, with the hopes of both teaching Anakin responsibility, and to help Ahsoka become more independent as well as less reckless. Master and padawan first met during the battle of Christophsis, to aid in the battle and pass on a message. The battle quickly turned against them, but they were able to succeed. Anakin was at first reluctant to take Ahsoka as a padawan, but they quickly found common ground. Ahsoka and her master went on a great number of missions for the Jedi and republic during the clone wars. They participated in battles at Gwori, Skytop Station, Maridun, and more. She forged a rivalry against dark Acolyte and Count Dooku’s apprentice Asajj Ventress, whom she fought with during several missions. She would also fight against General Grievous multiple times, as well as the notorious Jedi hunter Cad Bane. Responsible and honest, Ahsoka was touched deeply by the events of the war. She suffered knowing that clones under her command were being killed, and refused to let herself be used to blackmail others. Prone to overconfidence, Ahsoka would sometimes refuse to follow her master’s orders, but always admitted to her responsibility. One of the most important things that happened during the clone wars was the Mission to Mortis. Ahsoka, Anakin, and Obi-Wan traveled to the Chrelythiumn system. There, they met physical embodiments of the light side – the Daughter – the dark side – the Son – and balance between the two, known as the Father. During the mission, the three take shelter in a cave, and Ahsoka is awoken by a vision of her future. In it, her future self tells her that Anakin will fall to the dark side and that by staying with him she could prevent it. This became a defining conflict for Ahsoka during the rest of the clone wars. Near the end of the Clone Wars series, Ahsoka is framed for the death of a saboteur — responsible for a bombing at the Jedi temple — and imprisoned. Seemingly freed by her master, she is again quickly framed for the death of several clone troopers killed by lightsaber. She briefly allied with Ventress before separating, and being attacked by an unknown assailant. She was captured and tried by the Jedi council, but her master appeared to reveal the true culprit: Barriss Offee, a Jedi warrior, and previously someone Ahsoka thought she could trust. Ahsoka was invited to reenter the Jedi order, but she felt betrayed by the council and their lack of trust in her. Her master tried to convince her to stay, but she ended up leaving the order, leaving Anakin alone, and setting up the very events her future self had warned her about. Ahsoka was voiced by Ashley Eckstein for both the Clone Wars film and the television series. She was originally going to be named Ashla. She is fourteen years old when she first appears as Anakin’s padawan. The pattern of her face is inspired by the Studio Ghibli film Princess Mononoke. Ahsoka Tano is an interesting to the character corner. She is a major player in the only official canon television appearance (at least, until Rebels begins), but she appears nowhere else in the Expanded Universe. Other than the information that’s in the Clone Wars television series (as well as a comic book that was adapted into an episode) there is nothing about her. Following Lucasart’s decision to restrict current cannon to the live-action movies and this series, we may or may not have the opportunity to hear more about Ahsoka. We hope you’ve enjoyed this edition of the Star Wars Character Corner! Stop by each week for more fun fan info! Every few weeks, we like to use the Star Wars Character Corner to highlight a character from the series that stays out of the spotlight. Our previous entries Chewbacca and Yoda are well-known characters that stretch from one end of the series to the other, so this week we’re doing a character that has a smaller stage to work with, but is still quite well known: Lando Calrissian! Lando enters the picture halfway through Episode V as the administrator of Bespin. He is introduced as Han’s friend and rival, and the person that had the Millennium Falcon before Han. He betrays Han and the other rebels to Darth Vader, setting up Han’s capture in carbonite and the battle between Luke and Darth Vader. He returns in Episode VI after switching sides back to the rebels. He helps Han escape from Jabba, and assists the rebels in the destruction of the Death Star V2. 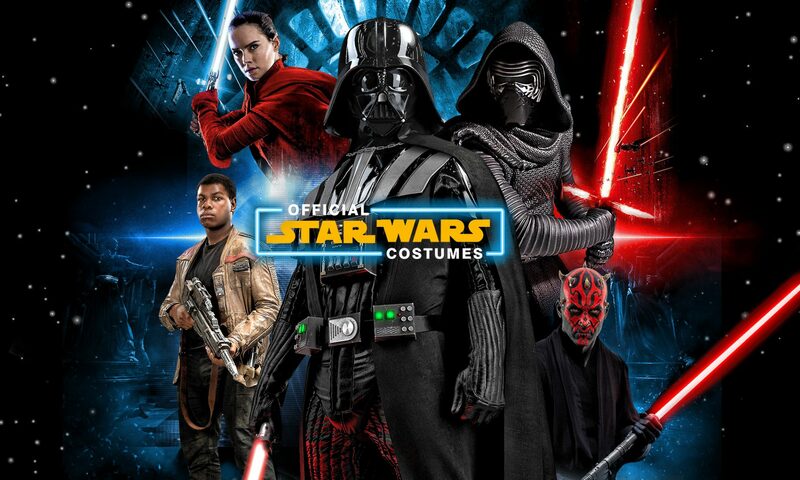 Official Star Wars Costumes is happy to announce this first installment in our newest blog series named Star Wars Character Corner. We’ll take an in-depth look at some of the famous characters, as well as some lesser-known characters. The first installment is of the famous walking carpet: Chewbacca! How tall is the actor that played Chewbacca? Keep reading to find out! Chewbacca, the Wookiee co-pilot to Han Solo during the original trilogy, is one of Star Wars’ most popular characters. He is featured in all three original movies as one of the main characters, and makes an appearance during the Kashyyyk battle as one of the leaders of the Wookiee forces that combated the Droids. Chewbacca was born two hundred years before the battle of Yavin on the lushly-forested planet of Kashyyyk. His father, Attichitcuk, was the head of their tribe. In his early years, Chewbacca was famed for his skill in climbing the giant Wroshyr trees, and for his mechanical prowess. He was forced to kill a rival Wookiee, Tojjevvuk, when fighting for the favor of a female Wookiee named Malla. Malla would later become Chewbacca’s wife. During the events leading up to the clone wars, Chewbacca met Qui-Gon Jinn and Obi-Wan Kenobi on Alaris Prime, a Wookiee colony. Chewbacca would end up assisting the Jedi on several other occasions before the end of the war. One such occasion was when Chewbacca helped Jedi Master Yoda escape the Clone Troopers after Order 66 was executed. Several years later, Chewbacca was injured during a firefight with a squadron of TIE fighters, led by Han Solo. Solo refused to kill Chewbacca when ordered to, and later ended up saving Chewbacca from torture. They escaped the Imperials with a bounty on their heads, and starting their lives as smugglers. Chewbacca swore a life debt to Solo as payment for sparing and saving his life. Han and Chewie (as Han affectionately called him) spent time as smugglers, traders, freighters, and more until they met Luke Skywalker and Obi-Wan Kenobi. They would be instrumental in destroying the Death Star and defeating the Empire. Chewbacca was hailed as a hero of the Republic Alliance and of the Wookiee race. His face was carved into a Wroshyr tree, a great honor for a Wookiee. After the end of the Galactic Civil War, Chewbacca would continue to assist Han and his wife, Princess Leia, in establishing the Republic. Conflicts from splintered factions of the Empire continued to appear and threaten them. Chewie was known to fiercely protect Han and Leia, as well as their children, whom he considered his own family. Twenty-five years after the battle of Yavin, Chewie, Han, and Han’s son Anakin went to the planet of Sernpidal during the war with the Yuuzhan Vong. The Yuuzhan Vong used a tactic to bring Sernpidal’s moon Dobido on a collision with the planet. The three of them were able to evacuate many people, but as the moon got close, Anakin was blown out of the Millennium Falcon. Chewie jumped down to rescue Anakin, but wasn’t able to return to the ship himself. Anakin was forced to pilot the Falcon away even as his father tried to help Chewie up. Chewbacca died when Dobido collided with Sernpidal. Chewbacca was played in all movies by 7′ 3″ Peter Mayhew, a British-born American citizen. Mayhew suffers from gigantism, which contributed to his huge height, and was also the cause of a double-knee replacement surgery in 2013. Mayhew was originally going to be played by David Prowse, but Prowse choose to be Darth Vader instead. George Lucas had the idea for Chewbacca when he saw his dog, an Alaskan malamute named Indiana, sitting in his car. Indiana would later go on to inspire another famous character. The original Chewie suit was designed by Stuart Freeborn, and made out of knitted mohair and yak hair. The sounds Chewbacca made were designed by Ben Burtt, the sound designer for all six Star Wars movies. He mixed different animal noises for different emotions, including walruses, tigers, camels, and badgers. The most prominent animal was a black bear named Tarik. Chewbacca is one of few fictional characters to receive an MTV Movie Award. He was given a medal by Carrie Fisher, the actress who plays Princess Leia, to make up for Chewbacca not receiving a medal at the end of A New Hope. We hope you’ve enjoyed the first installment of the Star Wars Character Corner. We will be running the Star Wars Character Corner on the blog occasionally, so be sure to check back for additional fun trivia!